Too many digital marketers focus on pre-click optimization strategies (ad headlines, display image selection, sitelink extensions, targeting, etc.) and don’t pay as much attention to the post-click stage. So it is no mystery that 97% of ad clicks don’t end up converting. This can be especially detrimental for PPC marketers since they dedicate so much budget to paid campaigns and can’t afford to waste budget on non-converting clicks. Therefore, dedicating more time to post-click optimization can be a campaign-changing decision. Post-click optimization is the process of ensuring that the ad click results in a conversion by directing prospects to a highly-relevant, optimized landing page that matches the ad’s message. When you concentrate on optimizing the user’s post-click experience, you motivate the user who already clicked the ad to also convert via the landing page CTA button. Your ads could have brilliant copy and compelling imagery, but if people click the ad and then don’t follow through with the conversion, it’s likely due to a poor user experience on your landing page. To ensure your ad campaigns are generating conversions, you must optimize your ads and your landing pages with the following four components. The examples below will discuss each component by demonstrating how each ad and landing page combination optimizes the entire user experience. Message matching is the process of coordinating your promoted content and corresponding landing page with similar headlines, imagery, branding, colors, calls-to-action, and most importantly — the highlighted offer. With strong message match between your pre-click and post-click advertising components, the user experience remains consistent from start to finish and people are more likely to fulfill the landing page conversion goal. The offer is exactly the same on both the ad and the landing page. 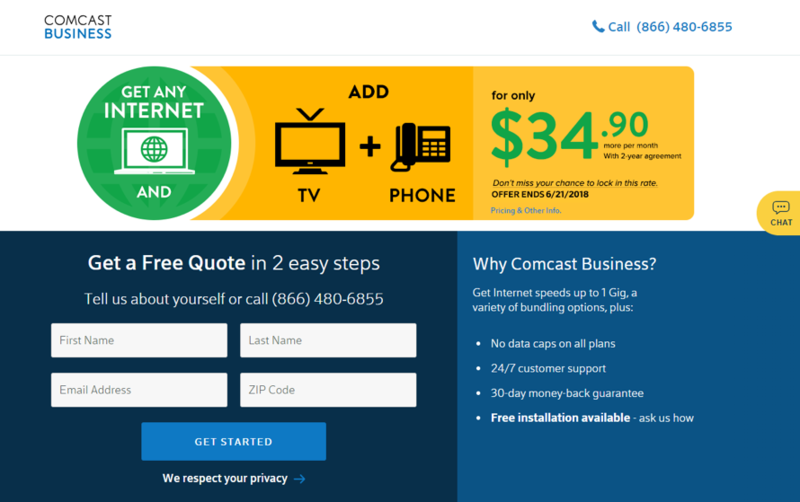 Both components use the same copy to describe the offer: “any internet”, “add TV/phone”, “$34.90 more per month”. The color scheme is the same, so it’s easy for visitors to tell they’re in the right place for the offer. Maintaining message match from ad to landing page is especially important for retargeting campaigns aimed at users who have previously visited your site. These prospects have already been exposed to your brand at least once, and this is your second chance to persuade them to convert on your offer. The conversion ratio is the number of clickable elements on your landing page compared to the number of conversion goals. Since a landing page is a standalone page created to promote one single offer (one conversion goal), there should only be one clickable element — the CTA button. No other navigation or external links on the page. This means the conversion ratio for an optimized landing page is 1:1. The Taboola logo in the top-left isn’t linked to the homepage. No header or footer links are present, nor are there any social media links that could take prospects away from this page. 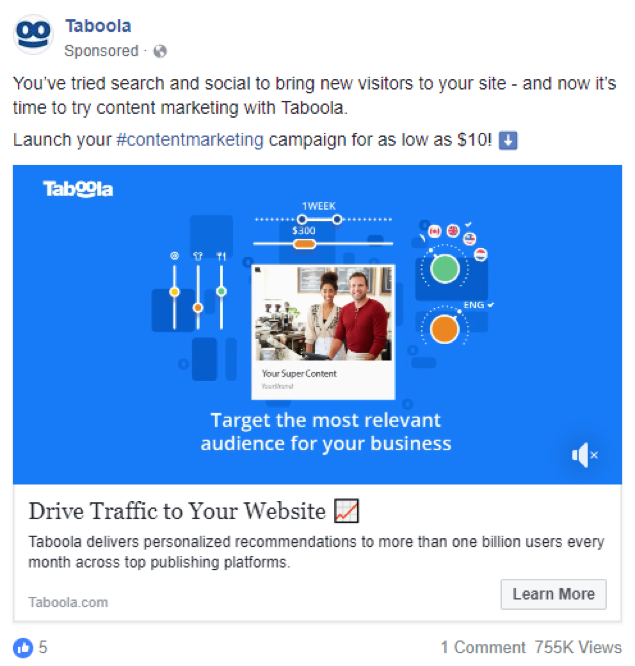 The page is promoting a Taboola account and all of the landing page elements—the headline and subheadline, copy, images, and CTA button — are relevant to the offer. Although there are three CTA buttons on the page, they all promote the same post-click action: sign up for a Taboola account. So this page maintains a 1:1 conversion ratio since all CTA buttons promote the same offer. 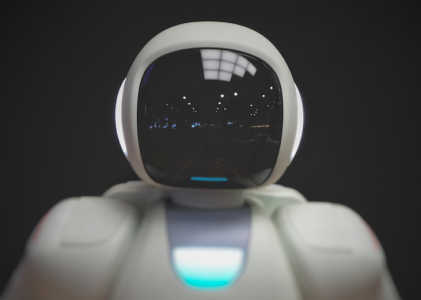 With all of the time and money spent on optimizing the pre-click experience to get people to your landing page, you don’t want to lose them as soon as they arrive. Keep your audience focused on the offer and engaged on the page by eliminating all off-page navigation links. The landing page CTA button just might be the most important element of a post-click landing page because that is what generates the conversion. The button should immediately capture visitors’ attention and persuade them to convert, making it easy for both of you to get what you want. The CTA button should demand attention so select a color that stands out from the background and everything else on the page. Color choice isn’t everything, though, because what you say influences whether or not visitors will convert or not. Crafting personalized, action-oriented copy is recommended. The orange color contrasts beautifully with the rest of the page. 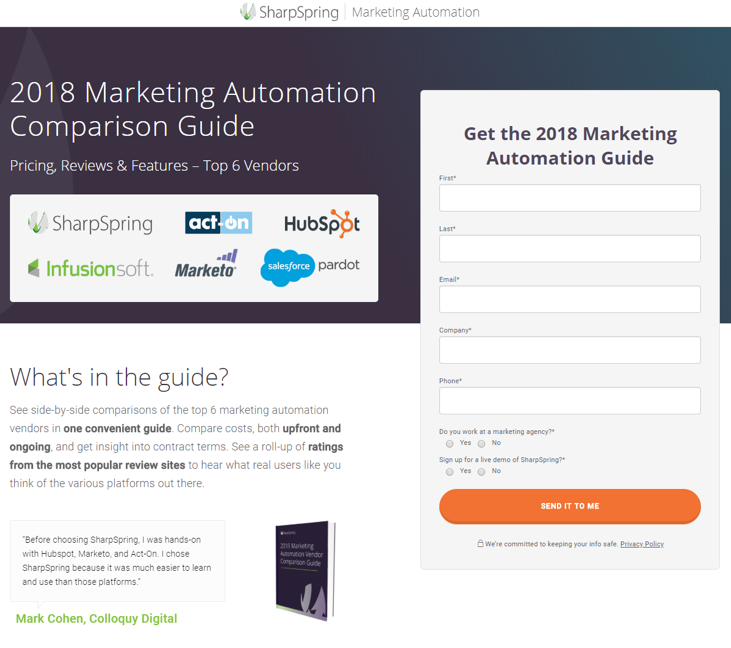 “Send it to me” lets prospects know exactly what clicking the button does — gets the guide sent to them. First-person copy makes the offer more personalized and relevant. Other ways to attract visitors to the CTA button include visual cues, like arrows and eye gaze, plus white space which can help each element separate itself from one another and “breathe” a little bit. All of these can work in conjunction to direct prospects’ attention to what you want them to focus on. 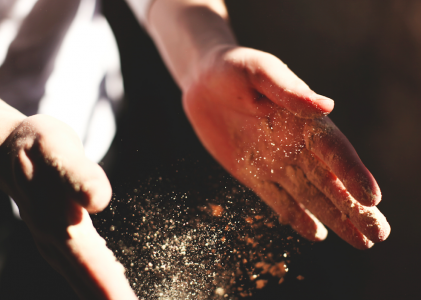 A fully optimized post-click experience doesn’t end with the landing page CTA button click. Taking it one step further — connecting your landing page to an optimized thank you page — allows you to acknowledge and thank the visitor for converting, making them feel appreciated and building a stronger relationship with them. Most importantly, it also presents you with another conversion opportunity. “Thank You!” is written in bold font at the top of the page so visitors are sure to see it immediately. The message underneath “Thank You!” lets visitors know they can expect a representative to contact them shortly. 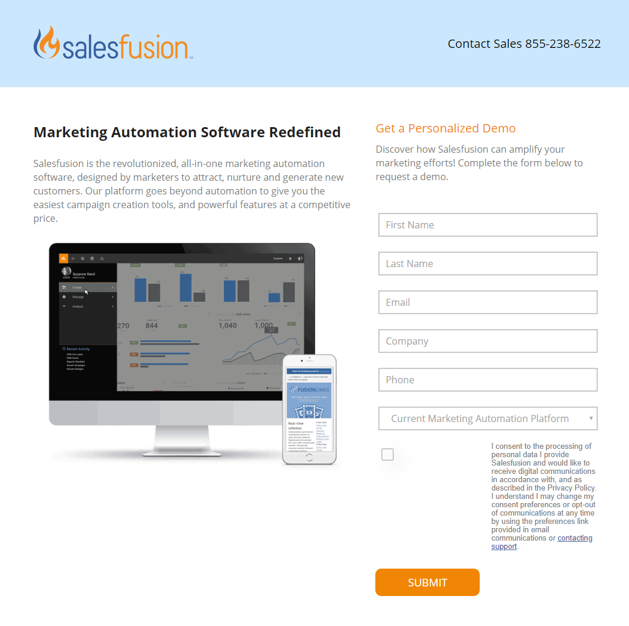 The three resources are all gated, providing Salesfusion additional conversion opportunities after the initial landing page CTA click. (Note: There is no image applicable to this thank you page since the offer is about a product demo. Had the offer been an ebook, for example, the cover page should be shown. An optimized thank you message can also be sent via email. 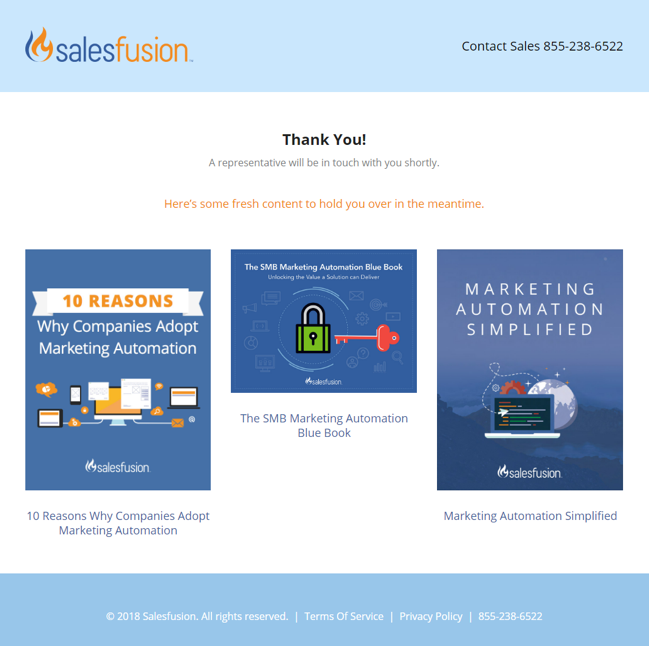 Both thank you pages and thank you emails show acknowledgement and appreciation to leads and customers, strengthening relationships and nurturing them further down the sales funnel. Don’t let your ads become part of the 97% that don’t convert. Get the most from your pre-click optimization efforts by perfecting post-click optimization. Always connect your ads to optimized landing pages with message match, a 1:1 conversion ratio, a contrasting CTA button and a thank you page with additional conversion opportunities. All screenshots by author, June 2018.